God created the Society. Not really, it was formed in 1966 by a group of history buffs in California. From this lowly beginning have come 17 kingdoms and 30,000 members. Entwined within these statistics, comes the legends and heroes that surround our own Kingdom, now celebrating 25 years of history. Who are those who had a hand in our beginning? Who are our heroes? To understand the roots of the Kingdom, we must start with our original kingdom, Atenveldt. In the 70's, there were only 4 kingdoms, East, West, Atenveldt and Mid-Realm. The Society itself was less than a decade old. At the time, there was a push from all levels to make more kingdoms. Thus, our Kingdom came into being in an incredibly short period of time. In November '76, Deaton & Care-Cheri, TRM Atenveldt, formed the Region of Ansteorra. In '77, a petition for principality status was signed at Steppes. There was only time for 3 princes in Ansteorra, for at the end of 1� years, Ansteorra was elevated to Kingdom status. In order to be a Kingdom, however, peers are needed. In March '79 an event was held called "The Tournament of Chivalry" but became known as "The Day of the Laurel". 8 Laurels and 1 Pelican were elevated that day-a record still held by Ansteorra. In May '79, the 1st Crown List was held in Bryn Gwlad. Any discussion of our history must start with our first King and Queen, Jonathan DeLaufyson Macebearer and Willow de Wisp. From their reign has come the unique flavor that is Ansteorra. Ours was a baby kingdom. Like many births, it had a difficult time being born. The difficulties culminated in our kingdom suffering through a Court of Inquiry. While this memory still saddens many who witnessed it, from the ashes of this tragedy our Kingdom emerged stronger. These early difficulties resulted in our firm desire to never allow outside influences to have an active part in our internal affairs again. It is from these times that our motto "Unicus et Singularis" (Unique and Singular) takes on additional meaning. Ansteorra is "Unicus et Singularis" in many respects. Our Kingdom was the cradle of the rapier community. Count Sir Simonn of Amber Isle and Countess Tessa of the Gardens were the champions of the rapier community. It was during their principality reign that the White Scarves were formed. In the words of Countess Tessa, "One of our favorite developments was asking Tivar Moondragon to help write a principality charter so we could recognize and honor combatants of the cavalier swashbuckling style, thereby naming Don Tivar as the premier "Don." Jonathan and Willow continued this principality award. But it was Lloyd and Jocelyn who declared Luigi di Donate the first Don of our Kingdom. Rapier is now practiced in many regions of the known world, thanks to the efforts of these heroes. The award of the Lion of Ansteorra confers neither precedence nor title, yet is the most coveted award we bestow. 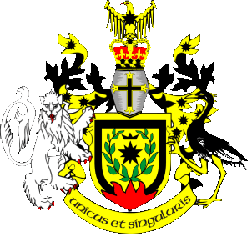 The Lions epitomize everything an Ansteorran strives to be: nobility, chivalry, honor, and personae. To be a Lion is to be that person. To be singled out, as a Lion is the highest honor our Kingdom has to give. Our premier Lion was Orm Skjolbidig followed by 46 others, 3 of which are fallen heros. Kings, Queens, Lions, Knights, Laurels, Pelicans and Dons are invaluable parts of our Kingdom. But without the voice of our Bards, recording and recounting their deeds, our Kingdom would be much impoverished. The bardic community continues even today to share our oral history. The first kingdom Bard was also our first King, Jonathan DeLaufyson Macebearer. We can boast such bards as Sieglinde Syr, Robin of Gilwell, Pendaran Glamorgan and many others since the first. Ansteorra continues to lead the way. Mahdi and Valaria created the Kings Archer with Gilbert Ost Westley as premier. Aaron and Britta created the Arcus Majorus with 3 premiers in '02. Mahdi and Valaria bestowed the 1st Golden Bridle in '98 while Migel I and Conal I bestowed the 1st Golden Lance. Both awards went to Alexis La Bouche and Henri le Hibou du Bois as primiers. We were the 1st to institute youth boffer combat. Today other kingdoms follow our model in forming their own archery, equestrian, and youth boffer communities. It would be shameful to not mention those who have passed from us after having given so much. Sir Ricardo di Pisa, Centurion Lawence the Rampant, Lady Elaine de Lyons, Baroness Adelicia Brabent and some 50 others remain in our hearts if not in our presence. Vivat these fallen stars of Ansteorra! We have come through trials uncounted with the help of many heroic individuals. The energy, vision and unique �we can do this� attitude of our kingdom, nearly destroyed in infancy, tempered by the strength and wisdom of so many is inspirational to people everywhere. One fact about Ansteorra that begs inclusion is our ability to believe our �game� is real. Our people believe in and live by their oaths of fealty to crown and kingdom. The populace accords the nobility a belief in their hearts that is not found elsewhere in the Society. This, coupled with our history and energy, makes an Ansteorran stand out no matter what Kingdom they reside in. This is what makes Ansteorra �Unicus et Singularis�. This is what will continue to lead us into an ever-brighter future and more glorious deeds as we march together into our next 25 years.